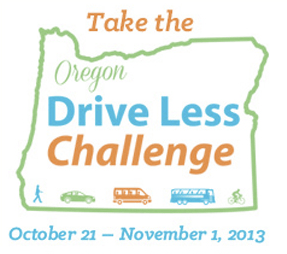 In a small but symbolically important step for a state transportation agency, the Oregon DOT held a “Drive Less Challenge” from late October through November 1. Events like this one are held regularly in cities around the country, but it’s the first time a statewide department of transportation has hosted one, according to ODOT. The people of Oregon did not disappoint. Motorists reported driving 913,664 fewer miles during the 12-day challenge. That total far exceeded the DOT’s goal of half a million miles. The program resulted in a reduction of about 659,000 pounds of carbon dioxide emissions and $225,000 worth of gas. Not too shabby! The largest share of avoided car trips — 22,000 — were made by bike, followed by 13,000 carpooling trips, and 10,000 trips taken by bus. Oregon plans to host the event annually. “We think the broad involvement really shows how practical transportation options can be in saving families money, improving community health and preserving our high quality of life here in Oregon,” said ODOT Director Matt Garrett, in a statement. This program fits within the state of Oregon’s goal to reduce greenhouse gas emissions by 75 percent by the year 2050, compared to 1990 levels. Stanford set out to make Oregon drive less. And it did.